We are delighted that David Hare’s critically acclaimed play The Moderate Soprano will premiere in the West End at the Duke of York’s theatre in 2018. The Moderate Soprano opens on 12 April with previews from 5 April and runs for a strictly limited season until 30 June. The Moderate Soprano enjoyed a sold out run at Hampstead Theatre in 2015. Jeremy Herrin will return to direct the play with brand new set and costume designs by the multi-award winning Bob Crowley. Roger Allam and Nancy Carroll will reprise the roles of Glyndebourne founder John Christie and soprano Audrey Mildmay. Further casting is still to be announced. 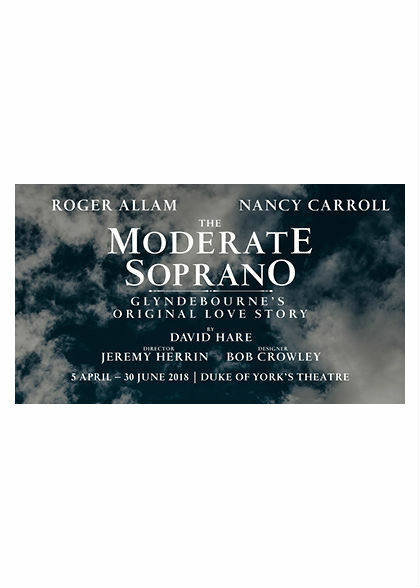 The Moderate Soprano is produced in the West End by Matthew Byam Shaw, Nia Janis and Nick Salmon for Playful Productions, Caro Newling for Neal Street Productions, Karl Sydow and Greg Ripley-Duggan for Hampstead Theatre in association with Raymond Gubbay and Bob Bartner.